It features organic turmeric and maca and comes in a 100 serving, 3 oz. tin. You can also use our online e-store. 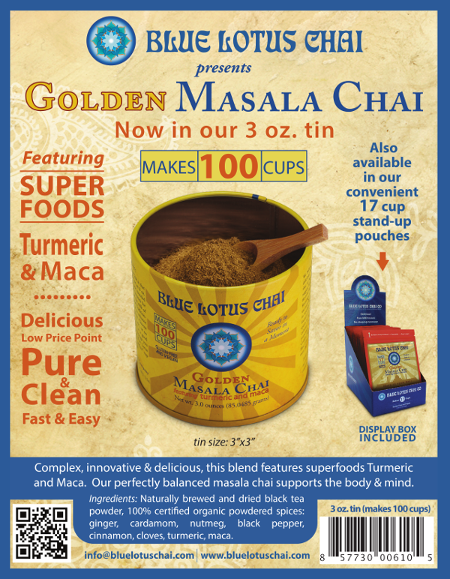 Blue Lotus Chai Company announces the release of their innovative & delicious Golden Masala Chai Tin, (100 servings in a 3 x 3 inch footprint). Along with their six signature spices, this innovative blend features superfoods turmeric and maca. 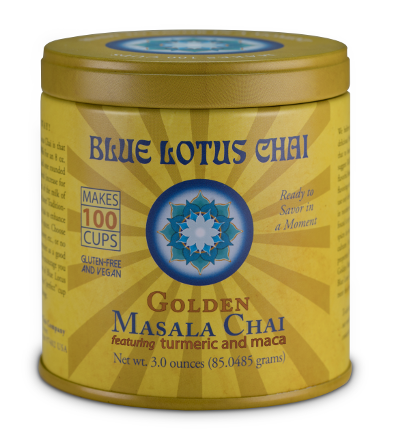 With this new variety in an uber-economical “pennies per cup” tin, Blue Lotus Chai continues to marry value and intentionality in their use of functional ingredients. Golden Masala Chai pouches (1/2 oz. 17 servings) were released in October 2015 and immediately generated an enthusiastic response amongst customers and store buyers alike. One of the unique qualities of this chai is that it is a hot water soluble ‘chai powder’. It allows anyone to make a delicious cup of authentic Indian Chai in seconds, without sacrificing choices around sweeteners, milk and caffeine. Ingredients are carefully sourced & are gluten-free, vegan, Non-GMO Project Verified, & organic whenever possible. For millennia, people in various cultures have recognized and used turmeric & maca for their health promoting benefits. Barbara Cameron, Founder & Co-owner, chose these ingredients for this formulation because of their vibrant and well-rounded taste, and for the way they support the body, mind & heart as a delicious daily ritual. In addition to Golden Masala Chai, Blue Lotus Chai’s family of hot water soluble chai powders are available in 5 other varieties: Traditional Masala Chai, Rooibos Masala Chai (certified organic and naturally caffeine free), Star Anise Masala Chai, Mint Masala Chai & Mandarin Masala Chai. All varieties feature a combination of organic spices and naturally brewed & flash-dried tea (black tea from Northern India or certified organic Rooibos from South Africa). All are free from sweeteners, milk powders, additives and preservatives. Based in Eugene, Oregon, Barbara –along with husband & Co-owner Stephan –have rapidly grown their vision into a thriving business;hundreds of retail locations across the US carry their Masala Chai and they are currently expanding into Australia and New Zealand. 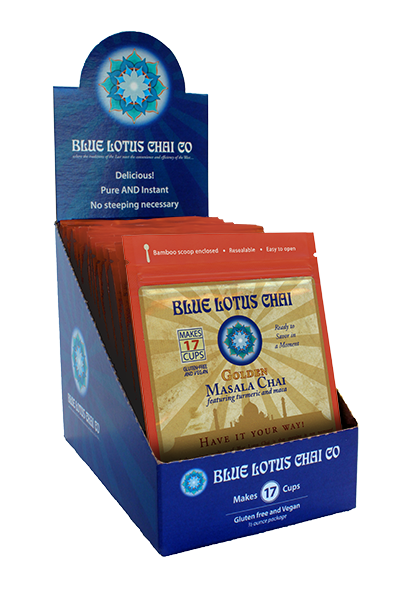 Blue Lotus Chai can be found in most natural food stores, a growing number of conventional grocers and gift shops, online e-stores, as well as in cafes & restaurants. The company walks their talk of ecological & social sustainability – they annually donate 10% of their net profits to groups that support these ideals, they utilize sustainable packaging options including bulk bags that are biodegradable/compostable, and they use tins that are designed to be reused indefinitely. Barbara discovered chai the way many others have — she drank it during her travels in India. Along with her practice of yoga & meditation, she fell in love with truly authentic Indian style Masala Chai. After arriving home in the states, Barbara found herself dissatisfied with the chai she bought as ‘chai concentrates’ from store shelves or that she drank in cafes. Ultimately, she could only arrive at that traditional taste she loved through painstakingly grinding the spices, brewing the tea, and warming milk for her mug every morning. This was time intensive, & she wondered if she could combine the authenticity of the East with the efficiency of the West… thus, Blue Lotus Chai was born. 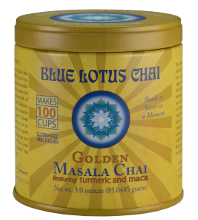 Blue Lotus Chai Company announces the release of their innovative & delicious Golden Masala Chai, featuring superfoods turmeric & maca. With this new variety, Blue Lotus Chai continues to elevate chai through the use of functional ingredients & intentionality. For millennia, people in various cultures have recognized & used turmeric & maca for their health promoting benefits. Barbara Cameron, Founder & Co-owner, chose these ingredients for this formulation for their vibrant & well-rounded taste, & for the way it supports the body, mind & heart as a healthful daily ritual.In addition to Golden Masala Chai, Blue Lotus Chai’s family of hot water soluble chai powders are available in 5 varieties: Traditional Masala Chai, Rooibos Masala Chai (Certified Organic & naturally caffeine free), Star Anise Masala Chai, Mint Masala Chai & Mandarin Masala Chai. This chai is unique in that it is a hot water soluble ‘chai powder’– it allows anyone to make a cup of authentic Indian Chai in seconds, without sacrificing choices around sweeteners, milk, caffeine or discerning palates. Ingredients are painstakingly sourced that are gluten-free, vegan, Non-GMO Project verified, & organic whenever possible. All varieties feature a combination of organic spices & naturally brewed & flash-dried tea: black tea from Northern India or Certified Organic Rooibos from South Africa. All are free of sweeteners, milk powders & additives.Based in Eugene, Oregon, Barbara –along with husband & Co-owner Stephan –have rapidly grown their idea into a thriving business with nearly 1000 retailers that carry their Masala Chai in 45+ states across America. Blue Lotus Chai can be found in most natural food stores, a growing number of conventional grocers, online e-stores, as well as in tea/coffee/smoothie shops & restaurants. The company walks their talk of ecological & social sustainability: they annually donate 10% of their net profits to groups that support these ideals, they utilize sustainable packaging options including biodegradable/compostable bulk bags & tins designed to be reused indefinitely. Barbara discovered chai the way many others have — she drank it on her travels to India. Along with her practices of yoga & meditation, she fell in love with real Indian Masala Chai. After arriving home in the states, Barbara found herself dissatisfied with the chai she bought as ‘chai concentrates’ from store shelves or that she drank in cafes. Ultimately, she could only arrive at that traditional taste she loved through painstakingly grinding the spices, brewing the tea, & warming milk for her mug every morning. This was time intensive, & she wondered if she could combine the authenticity of the East with the efficiency of the West…& thus, Blue Lotus Chai was born.